At Foundation Education, we’re dedicated to helping your students pursue their dreams. We’re a competitive RTO, known for delivering on our promises. We pride ourselves on service and excellence, tailoring our delivery options and resources to suit your needs and the needs of your students. We will be with you, and your students, every step of the way. Take advantage of our affordable Schools Program packages, flexible delivery options, specialist customer service, and quality resources, developed specifically for high school students – your students will thank you. As a schools coordinator or school principal, it can be challenging to balance a pre-determined curriculum with individual learning styles, particularly when not every student is suited to the traditional education structure. To make this decision easier, we have listed below the direct benefits of partnering with Foundation Education and making your students’ career goals a reality. Your students’ success is our priority. After all, that’s our entire reason for being here. We’re committed to quality education, helping young minds embrace their potential, and steering students on a path to career fulfilment. During their educational journey, we focus on the development of greater self-belief for each and every VET student. We want them to feel an enormous sense of accomplishment when they graduate with a nationally recognised qualification and succeed in their chosen workplace. Foundation Education has a proven track record with our school partners. Our drive to support and guide our students towards success has resulted in an industry-leading graduation rate of 92% and a student satisfaction rate of 80%. The biggest battle in getting students to commit to completing a schools program during their senior school years is providing them with engaging learning resources. Learning resources should be fun, enjoyable and leave a lasting impression on both the student and their parents. At Foundation Education, we’ve enlisted some of the best educational minds and combined their skills with powerful IT infrastructure to create an interactive and highly engaging online learning system. Our investment of time and money into building our unique platform is why our students remain committed to their course and go the distance to ultimately achieve their qualification, and graduate. Statistics prove that students who undertake vocational training certificate courses while in high school are significantly more inclined to stay in school for longer. When students feel they are learning practical skills that can be applied to a specific career, they see that there is an employment outcome, and that means earning money! That’s some strong motivation to keep learning and do well at it. Parents really appreciate that a schools program improves the likelihood of their child remaining at school – they often provide positive feedback. Comments about how much their child is enjoying their program and the value of the practical workplace skills they are learning are frequent and make our day! At Foundation Education, we pride ourselves on service and excellence, tailoring our delivery options and resources to suit the needs of your school. We are able to fit into your schedule, with one or two-year Auspice or online delivery. Foundation Education understands how time-consuming marking is. That is why 80% of course assessments are marked automatically by the system – reducing your marking time! Our partner schools often find that due to the high quality of our resources, many lessons are self-explanatory, with minimal additional preparation required from teachers. You’re never alone when you’re a Foundation Education Partner School. We will provide on-going support for you and your teachers every step of the way. Foundation Education understands the daily challenge faced by Educators of balancing pre-determined curriculum with individual learning styles. We understand that not every student is suited to a traditional course structure, so we strive to provide unique and valuable opportunities to keep students motivated. At Foundation Education, our Schools Program packages are focused on giving your students the best start to their career. We’re dedicated to helping your students reach their potential and we believe that the best way to do this is by providing students with the real life tools and resources they need to succeed in an increasingly competitive employment market. Our Schools Program packages are specifically designed for growing minds, motivating students to work hard with engaging, interesting and dynamic subjects and learning outcomes. Whether a student has their sights set on a certain career or not, our Schools Programs are an opportunity for them to experience a range of industries before making a decision. Our Schools Programs teach students invaluable skills directly connected to their chosen field, in a flexible and fun learning environment. With high graduation rates, we are known for delivering on our commitment to our students’ success. Are they continuing onto university? A selection of our courses may be used to gain advanced standing or credit points toward an undergraduate degree in a related discipline. Quality Resources – from targeted course content to cutting edge teaching methods, you’ll have access to a wide range of resources to help your students navigate the beneficial experience of learning with us. Reporting – our courses and assessments are marked automatically by our system – reducing your marking time. We submit student reports detailing the outcomes of each student – gauge their performance, chart their strengths and help them overcome any identified obstacles. Student Contact – if a student, for any reason, falls behind on their coursework, we will provide the required support and advice to ensure they get back on track with their goals. Minimal Preparation – our courses are straightforward, requiring very little preparation or explanation. We aspire to achieve a full-package learning experience to benefit teachers and students. Learn more about Foundation Education's Schools Programs and course qualifications. Our consultation process informs schools of student options that deliver a clear study and career pathway whilst at school and beyond. Customised training and development for internal staff ensure your school’s teaching environment is progressive and enjoyable. Not all high school students are aware of what career or study pathway is for them upon graduating. Give your Year 9, 10, 11 and 12 students and their parents the opportunity to ask important questions surrounding their interests at Foundation Education’s information booth. Our Schools Coordinators will guide students in making the right choices to support career aspirations in life after high school. This presentation is personalised to a specific group of students, or Department Heads, to discuss the benefits of delivering a Schools Program as part of a particular industry-focused subject. Foundation Education’s Schools Coordinators will host and present course options to parents to ensure their child can make an informed decision when it comes to their future. This presentation offers a clear insight into our programs delivery information, funding and payment options, and the benefits of Vocational Education and Training. The school leaver presentation provides graduating students with information on the options for further Vocational Education and Training through Foundation Education. Our Schools Coordinators discuss industry trends, course fees, funding models, and career and university pathways. 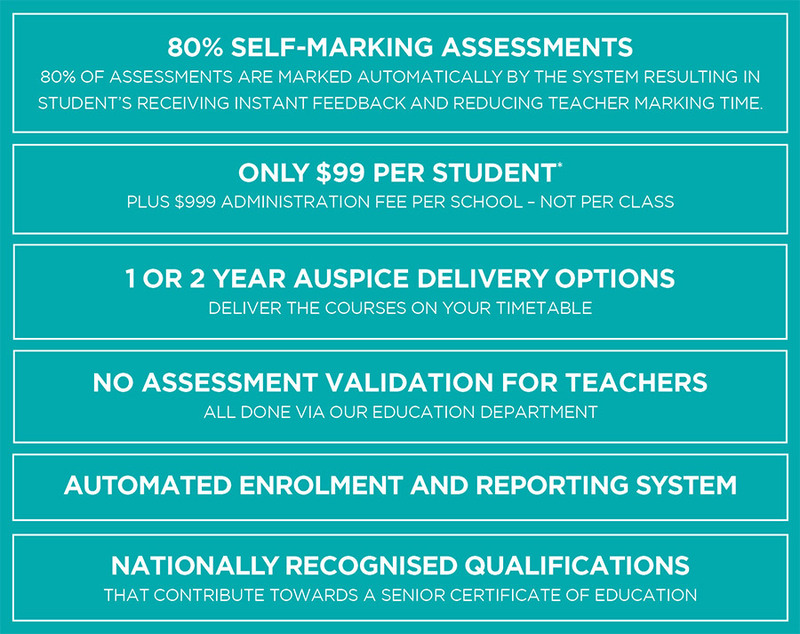 *$99 per student for Auspice delivery only. Please enquire for online course costs. Find out more today! Contact our Schools Coordinator on 1300 130 157.